Meetings are the only opportunities your staff has to update one another, share experiences, troubleshoot problems, and celebrate success. 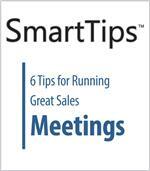 How do you make sales meetings a positive experience for everyone, rather than events to dread? This SmartTips video provides 6 tips for running great sales meetings. Sales recruiting is a tricky business. Tests, resumes and interviews can all be misleading. To choose the right person, you need the right tools. 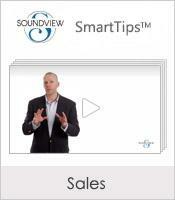 This SmartTips video provides five tips to help you make the right choice. How do you manage a sales team? Sales reps are a special kind of employee, and, as such, they deserve a special kind of management. Here are five SmartTips video tips that will help you make the most of sales talent while also ensuring that your sales force abides by the the rules and policies of your corporation. This collection of 16 SmartTips Sales videos will teach you the traits of a great sales professional, the 5 steps to a successful sales strategy, how to turn around a losing sale and much more.